And whenever I’d see one of these bikes, I’d wonder, "what’s he doing with that big bag of ?" Also seen, but not photographed were “giant tubes” and my all-time fav was scooter-assisted cargo bike. That happens a lot in China, btw, you’ll see all sorts of crazy things on the street. 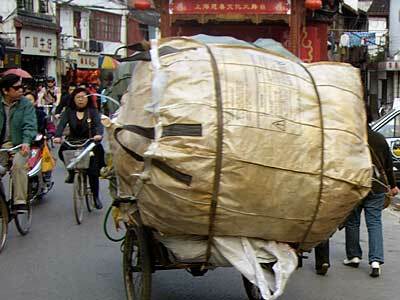 I’ll never forget bucket-of-meat bike in Beijing. Previous Previous post: Alfine Hub, Drop Bars: OMG I want that!